Bathrooms have long been seen as “that room” in the home where no-one wants to linger or spend prolonged amounts of time in. 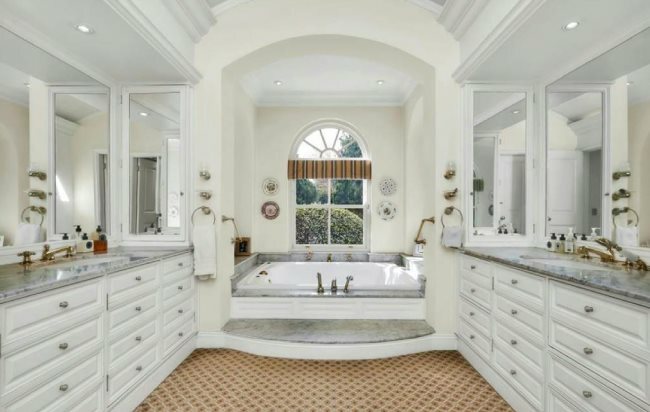 These homeowners, however, have opted to defy the status quo and have turned their bathrooms into a luxurious and welcoming space that invites you to sit back, take some time and enjoy the beautiful scenery both inside and out. Redesigned by renowned architect Philip Watermeyer, this five-bedroom English manor in Westcliff is beautifully set on 3965 m² of exquisite landscaped gardens that include a pool, tennis pavilion and court. The home itself boasts a central atrium, wine cellar as well as five garages. With its Italian Carrara marble, terracotta tiles and custom-designed Wilton carpets, the main en-suite bathroom is luxury personified and sure to satiate any lover of the finer things in life.